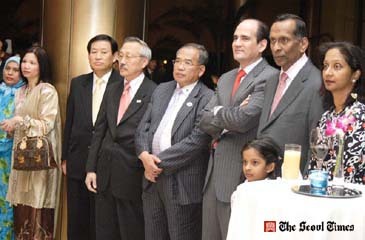 Malaysia Ambassador to Seoul Dato' M. Santhananaban (second from right) poses with MTPB Director Abdul Mutalib Awang (fourth from right) and other high-profile guests at Millennium Hilton Seoul. At right are wife and daughter of the Malaysian envoy. Director Abdul Mutalib Awang of Malaysia Tourism Promotion Board (MTPB) in Seoul hosted "Malaysia Food Festival" in a Seoul hotel on March 2, 2007 on the occasion of "Visit Malaysia Year 2007." About 100 travel-related and local media people attended the food feast held at 7 p.m. on the day at Millennium Hilton Seoul's "Café Cilantro." Among the VIP participants were Malaysia Ambassador to Seoul Dato' M. Santhananaban; Mr. Eric Swanson, general manager of Millennium Seoul Hilton; Mr. Lawrence Liew Kok Cheon, Korea area manager of Qatar Airways; Mr. Lim Chang-Hoe, area manager Korea of Malaysia Airlines; Mr. Mohd Rosly Selamat, chief operating officer of Pempena SDN BHD; and Mr. Jon Kim, vice president of Korea Tourism Association. For this Malaysian Food Festival three Malaysian shelves were flown into Seoul from Malaysia. Malaysia Food Festival runs between March 2, and March 9, 2007. For details or inquiries call Millennium Hilton Seoul at 317-3205 or Malaysia Tourism Promotion Board (MTPB) Korea office at 779-4422.